High corrosion resistant blades repel oil and hard water stains, preventing bacteria build-up and requiring only a simple clean–up after use. Soft streamlined handles to help relieve stress on fingers, providing a more comfortable grip. 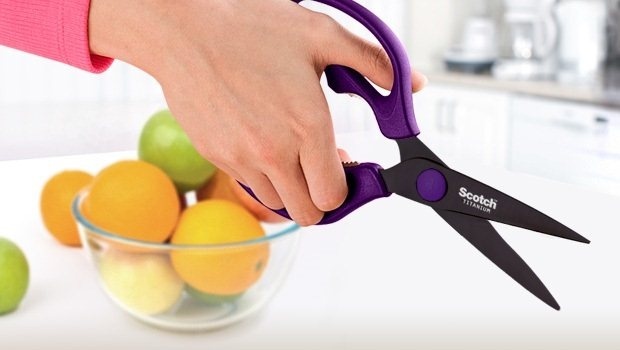 Designed with food preparation hygiene in mind, the latest addition of Scotch™ Red Titanium Kitchen Scissors can now be used in conjunction with the Scotch™ Titanium Kitchen Scissors in Purple to colour-code different pairs for raw and cooked food respectively. Colour-coded scissors can help minimize the probability of cross-contamination, lessening the possibility of food poisoning through cross-contamination. Treated using 3M’s Titanium coating process to enhance the ability of the material. 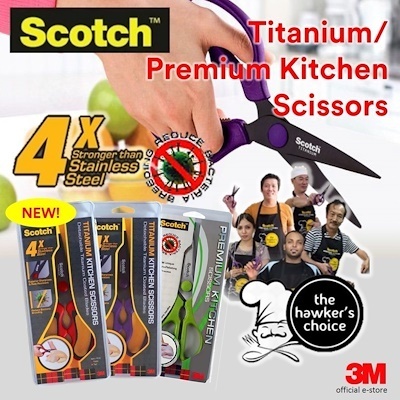 Titanium blades – 4X stronger than stainless steel, enabling the scissors to cut through meats like chicken, and even through soft bones with ease while retaining its sharpness for longer. Detachable blades for easier and more thorough cleaning (only for red & purple range). Not advisable for prolonged usage as knife. *Note: can be detached and used as a knife to cut vegetables, fruits and softer meat. Remove the hassle of washing chopping boards and knives by adopting these scissors-only recipes with Scotch® Titanium Detachable Scissors!